Kylie Jenner is pregnant with Travis Scott's baby! The latest news in tinsel town is that the youngest Kardashian-Jenner sister, Kylie Jenner is pregnant with her boyfriend Travis Scott's baby! The 20 year old Reality TV actress and Kylie Cosmetics entrepreneur is expecting her first child, a baby girl, with the 25 year old rapper, whom she began dating earlier this year when they met at Indie music festival Coachella. Kylie had been on and off dating Tyga since the past few years, but cut ties with him when rumours of his cheating began to circulate. The curvaceous star, who regularly takes to social media networks to pose raunchy and saucy snaps of herself, has been telling friends about her pregnancy and is said that the news came as a surprise though she is very happy. Kylie has always said in interviews that she wants to be a young mom, and having children after 30 seems too late for her. Both her sisters Kourtney and Kim had their babies after the age of 30, but Kylie seems excited at the prospect of being a young mother. Kylie and Travis Scott's baby will arrive in February 2018, a month after Kim and Kanye will be welcoming their third child via surrogate. The news, confirmed by People, also comes as the 10th Anniversary season of Keeping Up With The Kardashians is to be aired in weeks, and Kylie's news will certainly be the highlight of the season. Kylie Jenner had been giving off quite a lot of hints on social media networks about her pregnancy, with all her recent selfie shots being cropped or of just her upper torso. Here's to another Kardashian-Jenner in the making! Congratulations, Kylie and Travis! 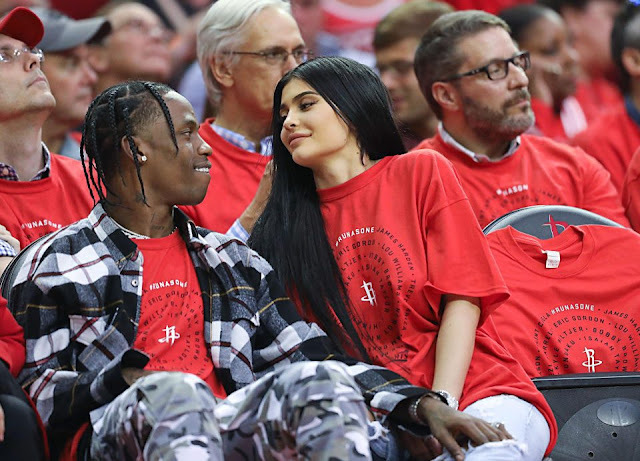 My Face Hunter: Kylie Jenner is pregnant with Travis Scott's baby!